As you check out your subordinate's "User Settings" page, you may find that several parts of their form is locked. This is due to how your organization chooses to assign permissions. At the bottom you may find a series of personal identifiers. This is due to how your Organization calculates data and assigns it to Users. We will walk through setting up the sections of the form below. First Name, Last name, and Email are most commonly locked and cannot be edited. These will be publicly displayed on your Dashboard. 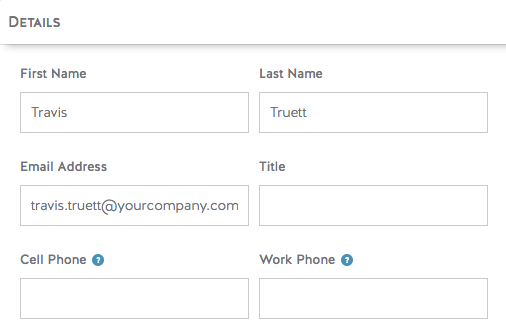 Title (optional per Organization) will be publicly displayed in the Details section of your Ambition Dashboard. Cell Phone will not be displayed, but privately held for not-yet-launched mobile notifications. 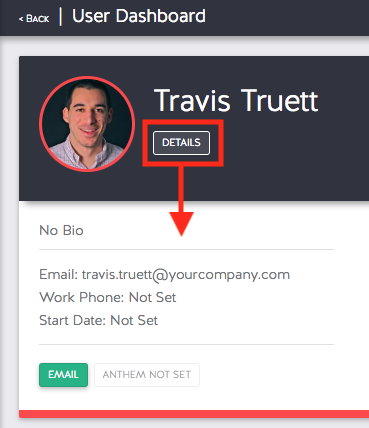 Work Phone(optional per Organization) will be publicly displayed alongside your Email in the Details section of your Dashboard. As mentioned, the majority of this information will be displayed by clicking the Details button on your Subordinate's Dashboard. If your Organization utilizes our Salesforce Integration, their Salesforce profile picture will have been synced over. If not, please take the time to upload a profile picture! Running into an error? Make sure your image size does not exceed our 2MB file size. You are given the option here to write a short bio about your subordinate, their Role, their history with your Organization, etc. Their bio will also be viewable by clicking the Details button on your Dashboard. You may be given internal guidelines or requirements as to what information needs to live here, but even if not required --please take a moment to write about the users for your team! An Anthem is your personalized YouTube video that will play on an Ambition TV when they've reached company-defined accolades. Set a custom GIF to add extra personalization to their profile image, presence on Leaderboards, and Slack Triggers. If your Organization utilizes our Slack Integration, this GIF will be displayed within Slack-based Triggers they initiate. We recommend using Giphy as the source for finding GIFs. Because Ambition supports the capability to recognize birthdays and work anniversaries, be sure to set both of these notable dates. Set your subordinate up for that work anniversary and birthday shout-out by setting these two dates! 1. 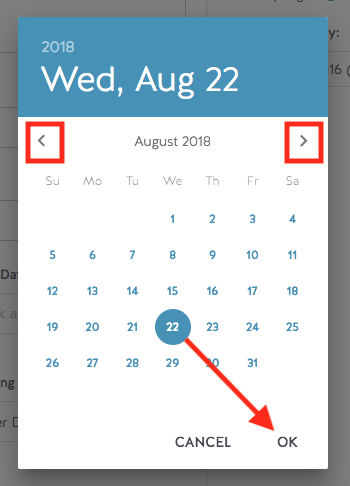 Clicking on the down arrow will populate a calendar where you can select the Month and Date for each occasion. 2. Use the side arrows to toggle to the correct Month. Click on the correct Day and then click Ok.
No need to fret, the year of their birth date will not be displayed! However, be sure to select the correct Year for their Start Date so they can be recognized correctly for their tenure. 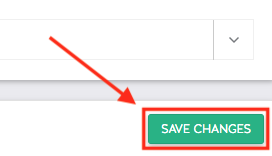 After all the respective updates are made, be sure to click the green Save Changes button at the bottom of their settings. What should Managers ask in a Coaching Session?